SINN FÉIN TD Carol Nolan has been suspended from the party after she voted against legislation to allow for the upcoming referendum on the Eighth Amendment. Nolan was the only one of the party’s 23 TDs to vote against the bill passing. “It is long standing Sinn Féin policy to support repeal of the Eighth Amendment and to campaign in a referendum to achieve that objective,” the party said in a statement. Sinn Féin Leader Mary Lou McDonald TD that she respected the fact that people “across society have deep and sincerely held views on the Eighth Amendment”. “Carol holds strong, personal convictions on this matter,” she said. “At all stages, the party has acknowledged and respected her views and her right to articulate those views. “However, Sinn Féin elected representatives are expected to respect policy decisions taken by the Ard Fheis and to vote in line with party policy. “All Sinn Féin elected representatives, including members of the Oireachtas, are aware of this. “Carol is a valued colleague and I very much regret this turn of events. However, as legislators we have a responsibility to vote as we are mandated by long standing Sinn Féin policy, a policy which we strongly believe is in the best interests of women. This is not the first time a Sinn Féin TD has been suspended due to their voting record on issues related to abortion. Sinn Féin TD Peadar Toibín was suspended back in 2013 for voting against the Protection of Life During Pregnancy Bill 2013, which Sinn Féin was supporting. Senator Máire Devine has also been suspended in recent days for retweeting a post which called Brian Stack, a senior prison officer shot dead by the IRA in the 1980s, a ‘sadist’. Earlier today the Dáil approved the second stage of the Bill which will form the basis of the upcoming referendum on the Eighth Amendment. The passing of this stage of the 36th Amendment of the Constitution Bill 2018 now allows the Dáil to begin considering possible amendments in the committee stage. The second stage of the Bill was passed by 110 votes to 32. Email “Sinn Féin TD Carol Nolan suspended after voting against abortion referendum”. 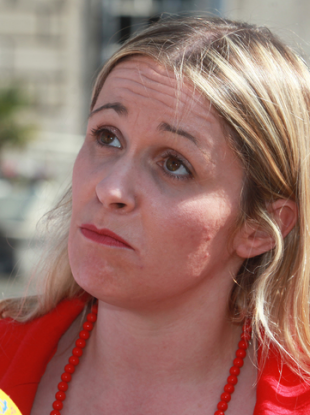 Feedback on “Sinn Féin TD Carol Nolan suspended after voting against abortion referendum”.